U.S. spends more on defense than any other country, and the defense budget would be bigger under Romney than Obama. 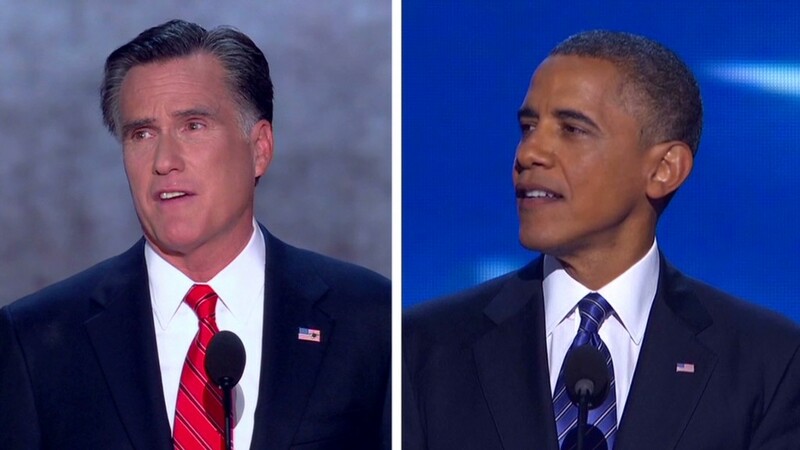 President Obama and Mitt Romney have a big disagreement over defense spending -- up to two trillion dollars' worth. Romney, by contrast, would be the bigger spender. He rules out any cuts to military spending as an option to curb the country's growing debt. "I don't think you cut [the] military for purposes of balancing a budget," Romney said Wednesday. Today, close to 16% of the federal budget is spent on the Department of Defense's base budget. Add in war funding and military spending accounts for closer to 20%. 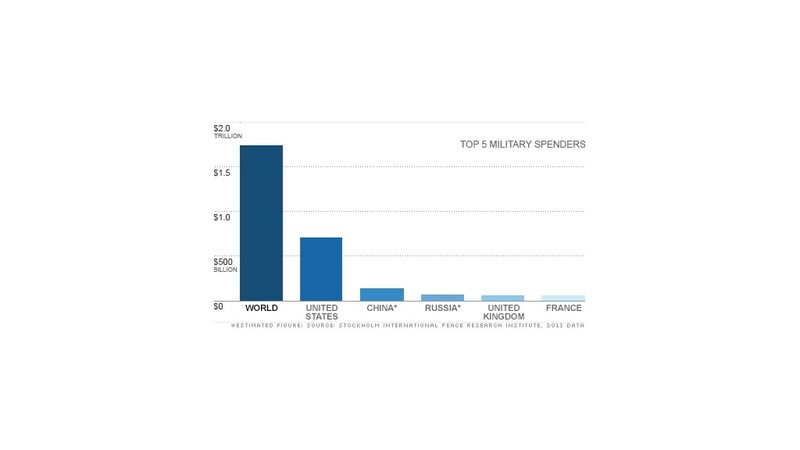 The United States is by far the biggest spender on defense -- accounting for 41% of worldwide military expenditures in 2011, according to the Stockholm International Peace Research Institute. Indeed, last year Americans spent more than all the other countries in the top 10 list combined, including five times more than China, the No. 2 spender. Those who want to reduce defense spending say the budget can be cut without compromising security if done carefully. Those on the other side argue that cutting defense would hurt jobs and hollow out U.S. forces. Barring legislative changes, the Pentagon's base budget is on track to fall to 12% of the federal budget by 2022, according to Congressional Budget Office projections. It would also fall to 2.4% of the size of the overall economy from 3.4% today. The anticipated withdrawal of U.S. troops from Iraq and Afghanistan, and spending restraints set by last year's Budget Control Act, are the main drivers. Here's how the candidates would change the defense spending trajectory. Poll: How much should U.S. spend on defense? Obama: In his latest budget, the president proposed spending roughly $5.8 trillion on the Pentagon's base budget over the next decade. In 2022, that means defense would account for roughly 11% of total federal spending. "Obama is essentially reducing defense spending a little and then keeping it flat over the next decade," said Todd Harrison, senior fellow at the Center for Strategic and Budgetary Assessment. Obama's proposal incorporates the $487 billion reduction in budget authority called for under the Budget Control Act. But it does not include the additional $500 billion in automatic cuts, also outlined in the act and scheduled for next year. The president, like many lawmakers in both parties, does not favor the additional cuts. But the White House has indicated he would oppose legislation that cancels them unless Congress replaces the cuts with a "balanced" debt reduction plan that includes higher tax rates on the rich -- something Republicans oppose. Obama has, however, exercised his authority to exempt military personnel from any cuts if Congress doesn't agree on a plan to replace the sequester. Romney: The GOP contender has said that one of his top priorities is to reverse what he says are $1 trillion worth of defense cuts instituted during the Obama administration. Specifically, cost efficiencies made by former Defense Secretary Robert Gates and the Budget Control Act reductions. But some defense experts don't consider all of the $1 trillion net cuts. For instance, they say, some funding was shifted from one Pentagon program to another. Romney also has proposed setting the Pentagon's annual base budget -- before additional spending on wars -- at a minimum of 4% of GDP. That means he could spend roughly $8 trillion on defense over the next decade, or about $2 trillion more than Obama has proposed. It's also $1.6 trillion more relative to policies under current law -- an increase he has promised to pay for with other spending cuts. His goal, he said, is "making sure that we have a military so strong that no one in the world would ever [want] to test it. And that suggests to me a commitment in the range of 4 percent of GDP is the right level." The base budget hasn't topped 4% of GDP since fiscal year 1992, Harrison said. Under President George W. Bush it averaged around 3.3%. Romney has ruled out curbing defense spending for the purposes of deficit reduction. At the same time, he has promised to balance the country's budget by the end of his second term. That's going to be a tall order, even if he favored defense cuts.